This past Sunday morning I had a movie-going dream come true when I finally got to see the 1964 Walt Disney classic Mary Poppins projected on screen. It played at Film Forum, a fantastic non-profit art/foreign/repertory cinema as part of their Sunday morning Film Forum Jr. program which screens all manner of family classics at cut-rate prices. I don’t mean to sound the shill, but really, if you’re in New York City and love cinema, looking up the programming at Film Forum can be very rewarding. 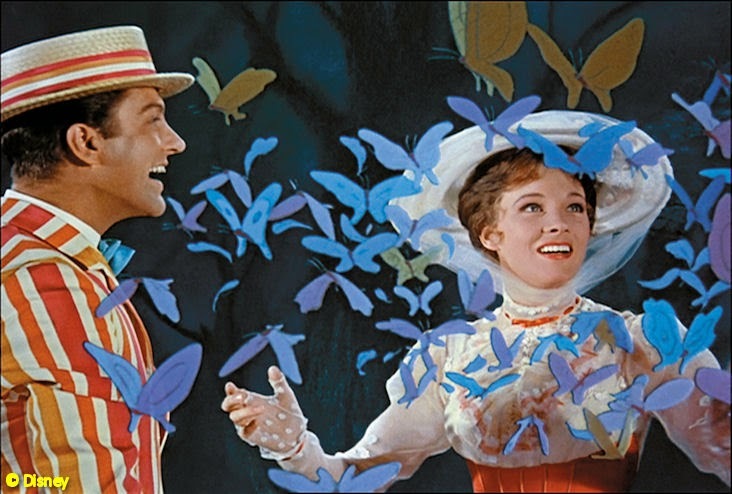 Mary Poppins has long been my favorite film from the Walt Disney era yet I feel I’d taken it for granted over the years. It’s always been there as a part of my life in one way or another. I’m assuming that you're already familiar with the film so please indulge me as I recollect how this marvelous musical film impacted my life. When I was little kid in the 1970s, home video didn't quite exist yet and I was exposed early on to this story of the Banks family and their magical nanny through records and books. 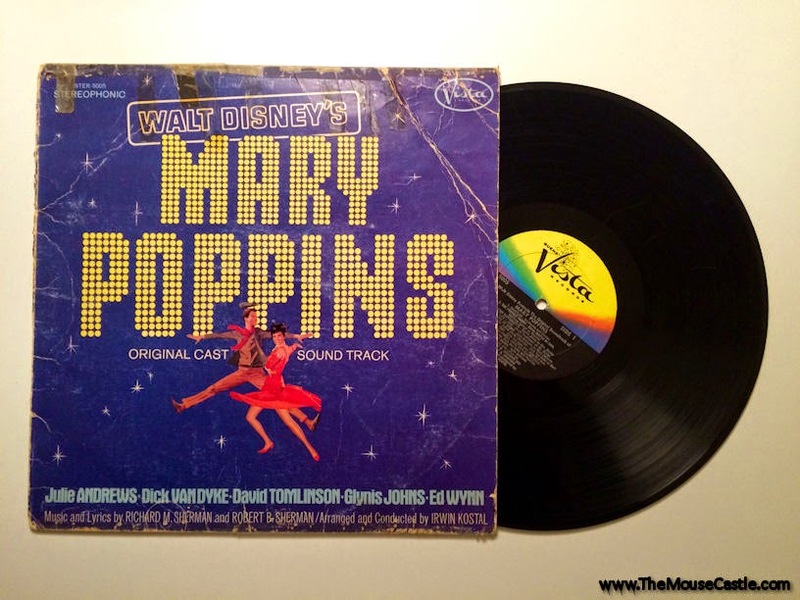 I first heard the songs on my family’s copy of the film’s soundtrack LP. This version of the album is on the Buena Vista Records label and was a re-release to coincide with the film’s re-release in theaters in 1973. I’m told I was taken to see the movie then but, well, being two years old at the time you could tell me anything and I’d have to take it at face value. Anyway, I loved listening to the LP when I was a kid and when I was deemed old enough to use my family’s Sears floor console stereo I gave it many spins. I was entranced by Julie Andrews’ gorgeous voice and had never heard any adult use such proper and stern language before. I fell in love. Being a child meant I also gave the LP lots of wear and tear which caused many skips and pops over the years. I remember my sister and I dancing to “Step in Time” on the gold shag carpet in the living room. Ah, the 1970s. Particularly funny to me now is the memory of my mom laughing with--and probably at--us as we would dance. We did all of the dance moves as they were called out but somehow misheard the lyric “Link your elbows!” as “Knees to elbows!” Knees to elbows was a very difficult move to master. It may have been the precursor to popping and locking. We were ahead of the curve, who knew? In the early 1980s, before The Disney Channel came along, HBO aired one Disney film per month and it was on HBO that I first got to see Mary Poppins for the first time. My eyes were glued to the TV set for the entire film. Everything about it was even more wonderful than I’d imagined it would be. My whole family watched it that night but they melted away from my consciousness as the film held me in its spell. Here was everything that my ten year old brain comprehended about what Walt Disney films were. There was glorious music, Julie Andrews, beautiful costumes and abundant special effects that were truly special: a nursery that cleaned itself up, a nanny could pull any number of things from her carpetbag and could duet with herself in a mirror, people flew and had tea on ceilings, they jumped into pavement chalk drawings and danced with penguins, and on and on but yet... there was also a remarkable story about two children who respected but yearned for their parents’ love and attention. Even when I was ten years old I got and understood that feeling. In some ways, I craved the same attention from my own parents. Being the youngest of four children with two working parents I often felt lost in the shuffle. I wished for my own Mary Poppins to come in from the sky to teach me valuable lessons the same way I’m sure countless children did. As I grew up into teenage indifference I kept my love for Disney under wraps. It wasn't cool, but I certainly wasn't hip. I always loved Mary Poppins though, I wanted to believe in her. Every now and then I’d listen to that battered LP quietly in my room. When I went away for college I pilfered the family’s VHS copy of the movie as my own. Flash forward about sixteen years to the Autumn of 2006. 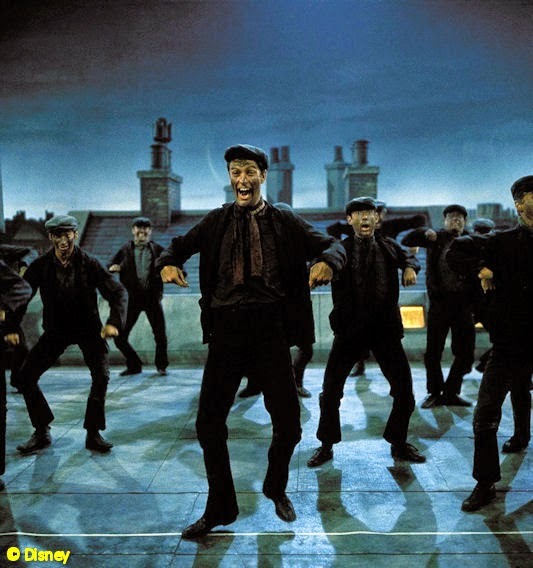 In anticipation of the arrival of the Broadway musical version of Mary Poppins I decided to read author P. L. Travers’ books, the basis for the film, and particularly the stage musical, for the first time. 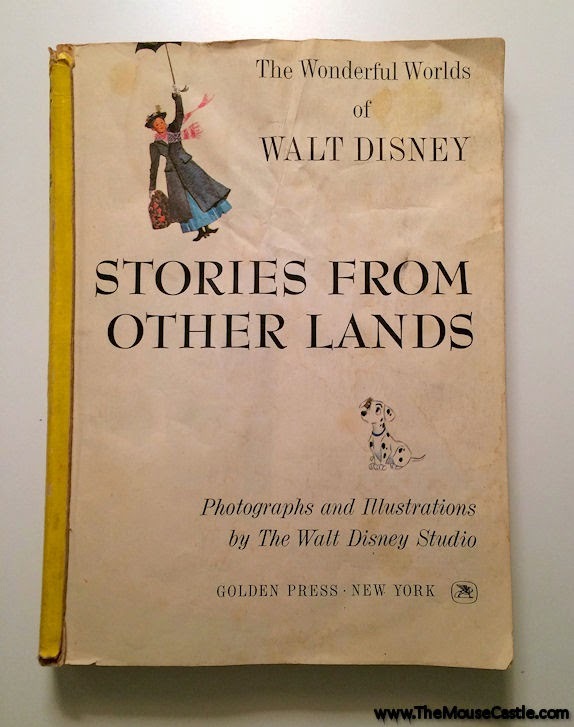 For years I’d read about how different they were from the film and how hard Walt had to work to get the rights to the stories and characters from Travers. I read the first two, Mary Poppins and Mary Poppins Comes Back and can not recommend them enough. They are dry, wry, dark, and very witty. Mary is stern and narcissistic, almost dismissive of the Banks children. I love Travers’ vision of Mary Poppins! It was fun to discover that the books are episodic. There is no through line of story as each chapter tells its own story of Mary Poppins and the Banks family. When I saw the musical on Broadway I was skeptical of it. I don’t like seeing shows based on films that are recreations of that experience, I want the adaptation to say something new and to resonate with audiences in the here and now. On the title page of the Playbill under Mary Poppins is the statement, “A Musical Based On the Stories of P. L. Travers and the Walt Disney Film.” Yes. Thank you. It’s very appropriate to list Travers first. 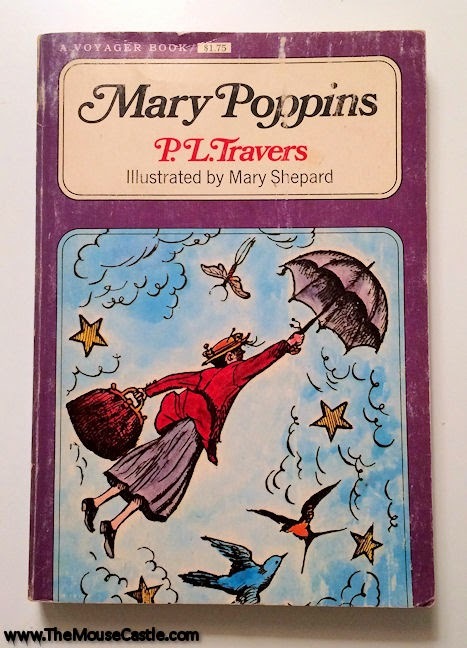 I appreciated the show for not only sharpening the focus of the story from the film where Mary Poppins repairs a fractured family, but also that it was true to the episodic nature and characters that P. L. Travers created while also remaining faithful to the spirit of Walt Disney’s musical film. It was a fine line to balance and the two styles of storytelling blended beautifully. I also loved that the show was what an adaptation should be: it’s own thing. I loved the musical. In its final image the Banks family, standing in a pool of light on a dark stage with their backs to the audience as each parent has their hands on the shoulders of their children, watch a star burst across the night sky. That image seared itself into my brain. My eyes swelled with tears. Mine weren’t the only dry eyes in the house either. I got to a place where for several years into adulthood I would view the film at least once per year. Countless viewings of the film led to comfortable familiarity yet always provided the same magic and escapism. I still loved the movie but didn't necessarily pay attention to it. 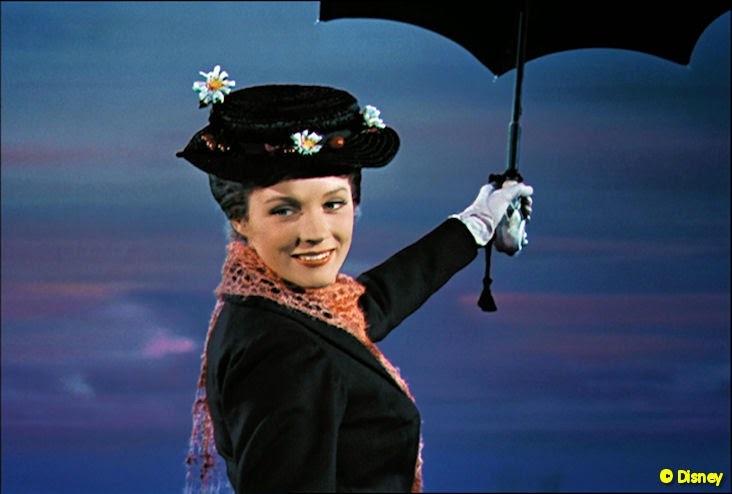 In many ways seeing Mary Poppins this past Sunday on screen was revelatory. Sure, I’d seen the sparkling and beautiful digital restoration on the Blu-ray release, which I’m pretty sure was mastered from what was on screen, but that was only part of it. For the first time in years, perhaps since that first viewing on HBO decades ago, I was drawn into the film. Seeing it on screen was like seeing it anew and experiencing it with a nearly sold out audience only enhanced its charms. People of all ages were there, from the elderly to the very young. It was wonderful to be part of it. Projected large not only did I notice things I hadn't before but the beauty of its art and design took my breath away. For the first time ever, in all of the countless viewings, the film brought tears to my eyes. First was when the camera pans down on the stunning painting of St. Paul’s Cathedral during “Feed the Birds” as the music swells, the second at the matte painting of the stunning vista of London as sunset turns to dusk just before “Step in Time”. But ultimately, what seeing this film on screen did for me was draw me into its story with a laser like focus. I laughed at the jokes and was enjoying my comfortable familiarity with the film beat by beat but was also struck by it. I noticed how much Jane and Michael longed for their father’s attention, my heart swelled when George, being fired from the bank feels the tuppence in his pocket and realized that money isn't what is important. His family is. When he presented a hastily repaired kite to his children at the end and the family left to be together for the first time in possibly ever I choked up. What was that? This movie has never made me cry. Feel happy, yes, but this time it was happiness through what had been sadness. The audience members around me must have had a similar experience as people stifled sniffs and wiped tears from their eyes. One man, sitting with his partner and their daughter in front of me, had to remove his glasses to wipe away his tears. When the film was over and the lights came up his family caught my eye again. The two dads gave each other looks and simultaneously took the hands of their little girl into their own. It just goes to show that a well crafted film becomes a timeless classic when one can identify with it through different stages of life. It gains shading and dimension. It’s nice to be reminded every now and then that the things we love, no matter how much we think we know them, can be new all over again.